Most women in the city confess that they do not have the time for any kind of leisure, or recreation, or self-enrichment! There will be a host of factors, along with gender, such as class and geographical location that create this condition. This made us wonder, however, whether an additional problem might be the fact that there are very few spaces in the city where women can seek leisure or self-enrichment. We are all well aware of the proscriptions imposed on women (of all classes) in public places, besides, even community spaces (for the poor), or commercial spaces like malls and cafes, present peculiar obstacles to women pursuing their self-enrichment. Can we think of a different space for women? 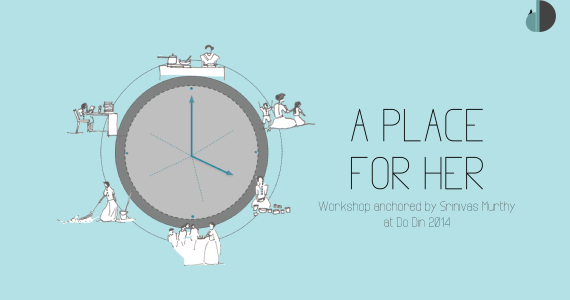 Do Din 2014 will be hosting a workshop in collaboration with Architecture and Design Foundation of India. The aim of this workshop is to engage with women from different parts of the city and from different social situations, to think through the obstacles presented by their particular situations and locations and to think about possible designs for institutions or infrastructures that will present avenues for women to seek recreation. A place for them. Join the workshop on 20th December, 10 am to 12 pm! Thankyou for your interest in the workshop! We have sent you some additional details on your email.